Hey everyone! 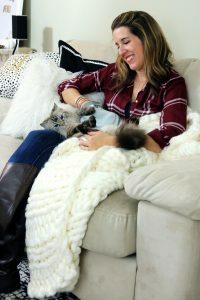 We all know that the holidays are almost here and today I’m sharing 5 Ways to Keep Your Pet Healthy During the Holidays. 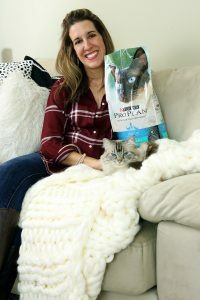 One way I keep my cat Rose healthy is by shopping at PetSmart for the food she loves, such as Purina® Pro Plan® FOCUS Urinary Tract Health Adult Cat Food. Purina is backed by 85+ years of Purina research. 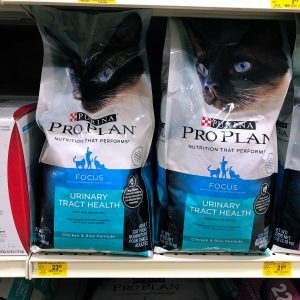 Their Pro Plan variety offers a 100% money-back guarantee (see proplan.com/guarantee for full details). Their FOCUS brand provides essential nutrients to help support a healthy immune system. 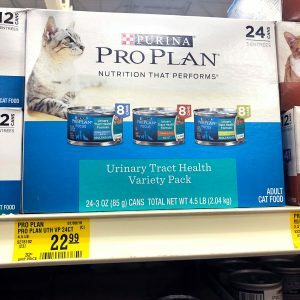 Hover over the photo to click through to PetSmart to shop Purina® Pro Plan® FOCUS Urinary Tract Health Adult Cat Food. Get a $10 PetSmart Gift Card When You Spend $40 on Purina® Pro Plan®. The Offer will be fulfilled within 8–10 weeks from the submission date. During the holidays, you know you’re going to be over scheduled, have last minute errands to run and jam packed weekends. You may not have as much time to pick up items your pets might need. In early November, I try to make a list of what pet items I need for the next couple of months and I buy them all at once. This saves me time and then my pet won’t be without their favorite treat if I run out, which never results in a happy pet! It also makes any return trips a lot easier, because I’m already stocked up on their essentials. 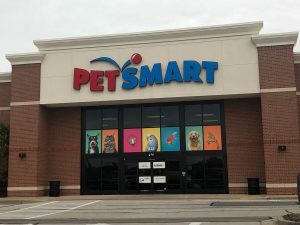 PetSmart is my absolute favorite store to visit for pet essentials, such as cat food, treats, toys and grooming supplies. They always keep their aisles stocked, their employees are friendly and helpful and I can get in and out of there quickly! 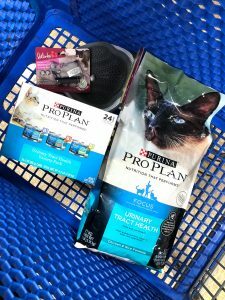 I stocked up on Purina® Pro Plan® FOCUS Urinary Tract Health Adult Cat Food in Chicken & Rice at my last visit to PetSmart. Rose is really particular about the flavors in her food, but she loves that this is made with real chicken. It helps maintain urinary tract health by reducing urinary pH and providing low dietary magnesium. The linoleic acid, an omega-6 fatty acid help support healthy skin and helps her to have a lustrous coat (this cat is ALL fur!). I also like that there are no added artificial colors or flavors. And, it is just part of the complete line of Purina Pro Plan wet and dry cat food formulas. 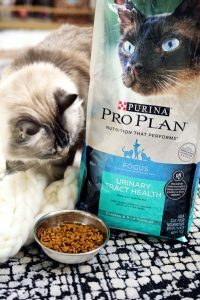 I also picked up a box of the Purina® Pro Plan® Focus Urinary Tract Health Adult Cat Food – Variety Pack. Rose loves the variety of flavors in this box and sometimes she craves wet food in addition to dry food. When I’m at PetSmart, I try to pick up one or two little extras for my cat to let her know how much I appreciate and love her. On my last trip, I picked her up a grooming glove (she loves to be groomed!) and a new mouse toy. During the holidays, you’ll be out of the house a lot more shopping, attending parties, etc. Your pet will definitely notice you’re gone more and will miss you! 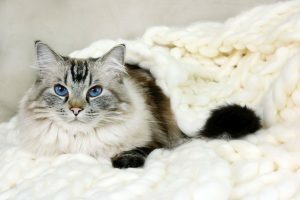 Even when you are home, you may be busy cleaning the house, wrapping gifts or perhaps you may be too tired to pay as much attention to your cat. This is the most important time of the year to give your pet some one on one time! Rose loves to be groomed, so I’ll sit with her and groom her and let her purr her little heart out. Try to give your pet at least 15 minutes of one on one time a day during this busy season and even more time if you can! If you have multiple people living in your household, try to allot each person to spend a little bit of their day with your beloved pet. If you are planning to have family and friends over for the holidays, especially if it is a big party… you’ll want to think about a safe place that your pet can retreat to if they’re shy, get anxiety over loudness, etc. We keep the door to our bedroom open so that Rose can go in there (and even hide under the bed) or we also have a cat door to our basement, which gives her a whole floor of the house to escape the loud noises that house guests bring. There are a lot of new items, foods, etc. in your house over the holidays and sometimes they can be dangerous for your pet. Our cat Rose is a rag doll and she will chew on items (just like a dog!) and one time she chewed several silk leaves off of a house plant that we had for a couple of months and she had to have surgery, because it made her very sick. Ever since then, we are really careful about any new item that enters our home. She loves plastic, so we never leave out plastic wrap, ribbon, any tags on stuffed animals or clothes (she will chew off the tag and try to swallow it!). 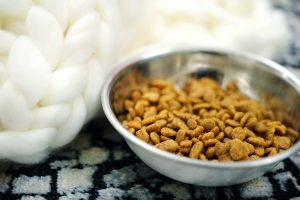 You need to be really careful about new foods that your pet may be introduced to or that may enter your home during a party. Don’t leave out raisins, grapes, avocados, chocolate or anything with artificial sugar. These are all really dangerous to all pets! You may want to pick up your house immediately after a party and not put it off until the next morning. Pick up anything dangerous to your pet and put it somewhere where they can’t get to it. Don’t miss out taking advantage of the savings offered right now on Purina® Pro Plan® FOCUS and be sure to stock up on your pet essentials this holiday season.